Tacky Tack of the Day: Arabians do not come in Buckskin. Or Overo. Or Tobiano. Or Palomino. Arabians do not come in Buckskin. Or Overo. Or Tobiano. Or Palomino. DO. NOT. EXIST. Period, the end. I see more and more "Purebred Overo Arabians" for sale every day. Doesn't happen, Arabians do not carry the genes for Overo. They DO come in Sabino, which can look SIMILAR, but is not the same thing. Why must everything have spots? I have also seen Tobianos advertised as purebreds. Um, no. That's a part Arabian, mayhap it is a very high percentage Arabian, but it is NOT purebred. WA Outrageous, the purebred SABINO daughter of Khartoon Khlassic. This pattern is often mistaken for Overo. Oh, and they don't come in creme dilute colors either. Thanks to Fire n' Ice, and his bleached mane and tail and membership to the Palomino "Breed" registry, everyone thinks they do. He is flaxen chestnut, not palomino. If you notice on his webpage, none of his PUREBRED get are palomino, or buckskin. Do we know why folks? Because the Creme dilute gene DOES NOT EXIST in the Arabian breed. You simply cannot have a buckskin, palomino, or other creme dilute purebred. Fire N Ice, who, despite being registered as such, is most definitely NOT a palomino. He does not even LOOK like one in this picture. He is very obviously a chestnut. Might I add, I LOVE WA Outrageous and most of Khartoon Khlassic's get. NICE horses with color, not Krazy Kolor Breeders at all. Well, 'overo' *is* sometimes used as a blanket term for any pinto pattern that isn't tobiano, including sabino. So...it's a reasonable confusion to thus think Arabians come in frame (a gene the creators of the breed would have known better than to perpetuate, just as more recently European travelers have kept it culled out of their colored horses). Are the people selling "purebred overo arab" or "purebred palomino arabs" the breeders or just someone trying to sell a horse and using blanket terms? Are they frauds or just ignorant? I can understand confusion over terminology. If a person claims to be breeding them, they are frauds or Krazy Kolor breeders - yeah often that's the same thing. I've used the term palomino very generically. Never partial to palomino or overo or sabino colors, so didn't bother to learn much. However, now that I've become so aware of Krazy Kolor breeders and the general ignorance (or fraud) over terminology, I realize the knowledge is important, just to protect yourself if nothing else. Besides, the genetics are fascinating. I agree with Jennifer overo is an umbrella term covering frame overo, sabino, dominant white, and splash white, anything not tobiano. If I saw that horse being advertised as frame overo it would irk me, overo, no. I have a red dun horse people call everything from palomino to chestnut/sorrel. He is a red dun not a palomino even though he looks palomino with his flaxen mane and tail. Proof there again, that if the horse industry is full of fruitcakes- the Arab industry is inundated with whackadoodle nutjobs. Does color really matter that much to a horses performance? Do spots or the lack of make them any better or worse of an athlete or companion? BTW- the full body shot of FNI shows him to be cow hocked and turned out in the back as a result. Confo breeders??? Not likely. All about the Kolor baby! What I don't understand is why people feel like they need to make this sh*t up. I have a beautiful tobiano part-Arab MUTT and believe me, he is PLENTY Arab. Arabs do come in splash. But there is a lot of denial about it for whatever reason. So Arabs do come in sabino rabicano and splash. Frame overo, not so much. I have also seen farms claim their flaxen liver chestnuts are silver. Another dilute that doesn't exist in Arabs. ^ That actually made me lol since silver doesn't even express on chestnuts. 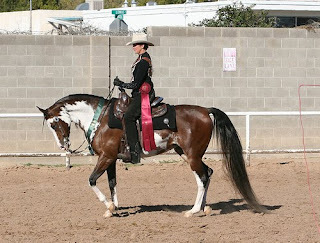 Both the APHA and the PtHA use "overo" as a blanket term to include Sabino, so if there is nothing incorrect in referring to a sabino as an overo. Many patterns fall under the "overo" umbrella. Flaxen chestnuts in Arabs are common. I think 2/3 of people who don't know that flaxen or taffy chestnuts are common would mis-register them as palomino. And I agree that overo is a blanket terms as well. Why not just register them with one of the many good part-Arab registries? A GOOD horse is NEVER a bad color! If your horse is a half Arab and is still a show winner, what does it matter what color it is!? You'll still be able to boast a show record for your half-Arab, and that's not a bad thing! If your half-Arab has a show record consistently and has good conformation, then you've already got a better horse than many of the purebred Arabian breeders. I'm not sure what PHBA was thinking when they registered Fire N Ice. I have seen quite a few people that say they have a palomino offspring of his. Yeah sure..please let me know when he has a cremello foal. I only wish Arabs came in dilutes. Now the overo thing, I can sort of understand, it has only been the last 10 years, maybe 20 that we have been able to test and differentiate between the patterns..and even that is a guess sometimes. I guess the key is to know what you are looking for and don't let the krazy kolor breeders convince you otherwise. I really like some sabino arabs, I would love to have one with a bit of color. They were frowned upon for so long too which didn't help. You can obviously tell that Fire N Ice is NOT a palomino! 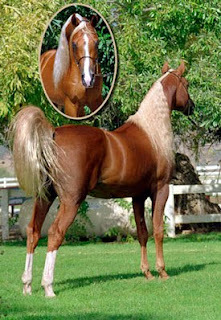 He is a beautiful, light chestnut Arab. His owners are not amateurs. I bet they know he's not a palomino. If they don't then they are just stupid. I have Half Arabians and to me, it makes a huge difference if they have spots or not when it comes to marketing. I have 8 tobiano pinto Half Arabians. All things being equal, I can sell the spotted ones for double what a solid will bring - so no wonder people want to breed for spots or for the more exotic colors. There is a market for them - provided that they are also quality animals under that color. The color is the icing on the cake. But we all know, it's the sizzle that sells the steak. I have a friend who raised some of the highest concentrations of Arabian blood in the palomino color in the world - yet they are still registered as Half Arabians no matter how high a blood percentage they become. She's been carefully breeding them for over 40 years and her horses have generations of palominos in their pedigrees. She has had "discussions" with FNI's owner about the lack of palominos (of course)in his pedigree. If he IS palomino (which he is not) where did he get his color? He's still a pretty horse and that's what sells to alot of people. "What I don't understand is why people feel like they need to make this sh*t up. I have a beautiful tobiano part-Arab MUTT and believe me, he is PLENTY Arab." We can thank the Wal-Martification of knowledge generated by the APHA, AQHA etc. juggernauts. I just thought I'd like to add something I thought was funny. Arabhorse.com has Fire an Ice listed properly as a chestnut. Okay people, I know this is a really old thread... But relax, Fire An Ice's owners know that he is not genetically palomino as I remember them stating "only in color". http://www.palominohba.com/about-phba/ states that: "Palomino horses registered with Arabians are eligible for registration with PHBA provided the horse meet color and white rules." (I shortened it to just Arabians since it listed many breeds) They only go by visual appearance. I rode a purebred son of Fire an Ice on quite a few endurance rides. He was flaxen,typey, out of a polish/crabbet mare and so many people insisted he was paliminio. It drove me crazy!